This is certainly true when we refer to those palm-sized pasta pouches filled with savoury ingredients – ravioli! 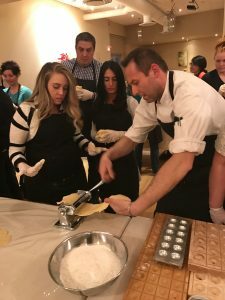 March 20 was National Ravioli Day and we marked the occasion with an interactive cooking class and dinner. First guests were treated to ravioli stuffed with prosciutto and caprino cheese in a butter and sage sauce. The dish was followed by a sweeter version for dessert, artfully designed chocolate ravioli. For those of you who have been with us since the beginning, ravioli stuffed with prosciutto was a popular menu item in the mid 1990s. Handmade by the late Ramona Mazza, these ravioli were served with our signature rosé sauce of the time. It was best served with a glass of Chianti Ruffino, another top wine pick then. Ramona brightened our kitchen with her culinary flair, deeply rooted in tradition of the Le Marche region of Italy. Thanks to Ramona and women like her who have graced our kitchen with the art of pasta making, Verdicchio continues to produce authentic Italian cuisine. Both Francesco and Claudio, both trained in Italy, bring that same enthusiasm and skill to our kitchen. As we carry on these culinary traditions, it’s important that we share them with you. 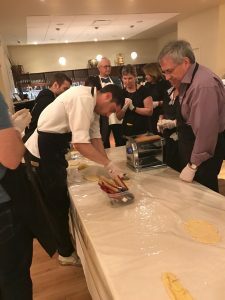 We have had such great feedback from our Ravioli Day class and dinner that we are planning to introduce more of these type of events on a regular basis. 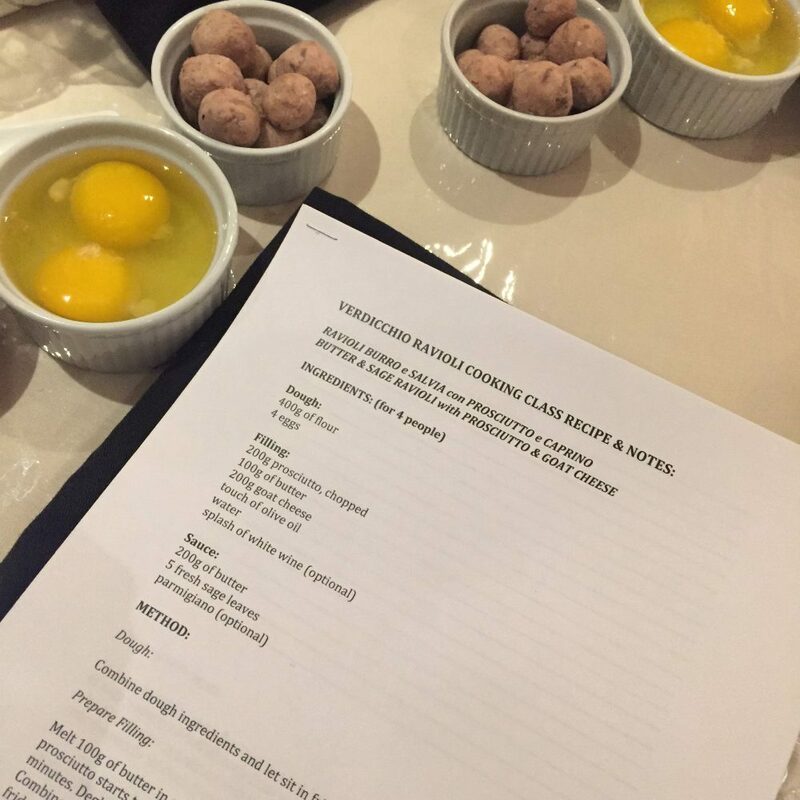 Stay tuned for more hands-on cooking classes and dinners. In the meantime, let’s celebrate ravioli! Try making some at home with our recipe below. •Stuffed pasta can be traced all the way back to the 11th century Arab world. •India has as a popular dish called Gujiya, similar to ravioli although it is prepared sweet, with a filing of dry fruits, sugar and a mixture of sweet spices, then deep-fried in vegetable oil. •Jewish cuisine has a similar dish called Kreplach, a pocket of meat or other filling covered by egg pasta. Dough: Combine dough ingredients and let sit in fridge for 30 minutes. Prepare Filling: Melt 100g of butter in a frying pan and add 200g of chopped prosciutto. When prosciutto starts to sizzle, add water and allow prosciutto to steam for about 10 minutes. Deglaze with white wine (optional.) Once cool, drain excess water. Combine steamed prosciutto with a touch of olive oil and 200g goat’s cheese. Set in fridge for 45-60 minutes. Combine with sauce: As soon as ravioli start floating, in a hot frying pan melt 200 g of butter with 5 leaves of sage – scoop ravioli directly from water with a skimmer and then toss gently while the butter is melting with the sage. Add a couple of spoons of the hot water into the pan to thicken. (optional: add a little parmigiano to taste.) Enjoy!